Been so long since I’ve logged in and update this blog of mine..been busy lately..
And now here we are in the month of December,the very last month of the year.I don’t even realize that i have already spent 11 month this year,what i have done,haven’t done and what I’m suppose to do or get it done by the end of the year.I have to do a quick recap starting with my new year resolution (early 2010) and do a checklist to see that i have fulfill it..
By the way,December comes with a bang for me cos there is Christmas..yay! !i love Christmas cos of the presents and stuff plus sales and big discounts..love it.today i went on a Christmas shopping,well I’m supposed to buy a gift for a colleague of mine.I was thinking bout what to give her and i prefer giving something she will enjoy,something that i like,love and enjoy too.I’m so into makeup actually guys,and my makeup knowledge is okay,i put on makeup everyday cos i really enjoy doing it. I went to Etude and bought all these for her..Etude house are having their sales right now and i managed to grab a few sheets of mask (since i love face mask so much) for my self.Price range is okay plus with the discounts given you can save more.If u want to try out their products,this is the right time for you to go and get it.Discount’s up to 50% (that was what i saw),and yeah i just grab the stuff on discount (hehehe).There are gift set as well,if you want to save your time you can just choose any gift set to go.Unlike me,I took the time with my little basket and walk around the shop 😀 On top of that,add RM6,you can get the gift bag (the red one).So,your etude gift will be perfect.Looking forward to my Department Year End Dinner now cos I’m going to give this to her.I hope she love it,like it cos i put lot of effort and money in it plus it’s makeup..Have a nice weekend you guys..annyeong. 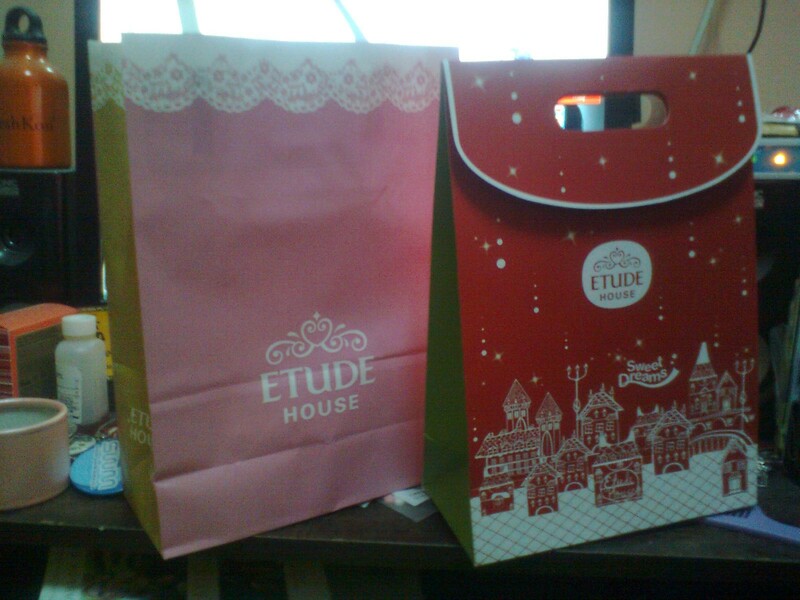 This entry was posted in beauty, christmas, etude, k-pop, makeup, shoppaholic, shopping. Bookmark the permalink.